First a friend, then an enemy of the United States, Manuel Noriega, the strongman of Panama, was finally taken down by a U.S. military operation, captured, and brought to Miami for trial on drug charges in 1989. Manuel Antonio Noriega was born the son of an accountant and his maid in a poor section of Panama City, Panama, in 1934. At the age of five he was given up for adoption to a schoolteacher. He attended the National Institute, a well-regarded high school, with the intention of becoming a doctor, but his family could not afford to send him to medical school. Instead, Noriega accepted a scholarship to attend the Chorrios Military Academy in Peru. He graduated in 1962 with a degree in engineering. Returning to Panama, he became a sublieutenant in the National Guard. Colonel Omar Torrijos (1929–1981) liked Noriega and obtained for him the command of Chiriqui, the country's westernmost province. In October 1968, they led a military takeover of the government of President Arnulfo Arias. Noriega's troops seized radio and telephone stations in the city of David, cutting off communications with Panama City. Torrijos emerged as the major figure in the new government. In December 1969, when Torrijos was out of the country, a trio of officers tried to seize power. Torrijos flew his plane into an airport in David that had no lights for night landing. Noriega lined up cars along the runway with their lights on to help Torrijos make it down safely. With Noriega's troops at his service, Torrijos reclaimed the capital. them into exile in Ecuador. Torrijos once said of Noriega, "This is my gangster." Torrijos died in 1981 in an unexplained plane crash. 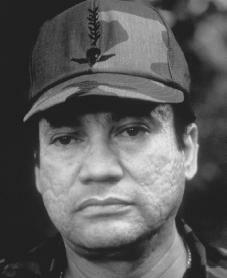 In the following two-year contest for power between politicians and military officers, Noriega emerged as the winner. In late 1983, following his promotion to general and commander of the National Guard, the guard was combined with the navy and air force into the Panama Defense Forces (which also included the national police). The following year Noriega's choice for president, Nicolás Ardito Barletta, won a narrow victory over Arnulfo Arias. But Barletta failed to improve the country's weak economy (system of production, distribution, and use of goods and services), and Noriega forced him out. Noriega at this time began to be suspected of gun trafficking (smuggling), money laundering, torture, murder, and selling U.S. information and technology to Cuba and Eastern European governments. Noriega denied wrongdoing and said U.S. politicians were looking for a way to undo the Panama Canal treaties before the canal became Panamanian property on December 31, 1999. In June 1987 Noriega's former chief of staff, Colonel Roberto Diaz Herrera, stated that Noriega had fixed the 1984 election and ordered the killing of Hugo Spadafora, who had publicly accused Noriega of drug trafficking. Herrera also said Noriega had been involved in Torrijos's death. Panamanians organized protests demanding the removal of Noriega. He responded by declaring a national emergency. He suspended constitutional rights, closed newspapers and radio stations, and drove his political enemies into exile. Herrera was captured and ordered to recant (take back) his statements. Church leaders, businessmen, and students organized into the National Civil Crusade, dressed in white, and went into the streets banging pots and pans. The riot squads drove them away. By now Americans were outraged, and in June 1987 the U.S. Senate called for Noriega's removal. The administration of President Ronald Reagan (1911–) began looking for a way to bring Noriega down. The U.S. economic and military assistance ended, Panamanian bankers began withdrawing their support, and Noriega quickly lost favor everywhere except for the Panama Defense Forces (PDF). Secret talks were held between U.S. officials and Noriega's representatives calling for him to resign and leave the country before the 1988 U.S. presidential election, saving George Bush (1924–), who as director of the Central Intelligence Agency (CIA) had dealt with Noriega, from embarrassment. The Justice Department filed charges against Noriega in federal court in early 1988 as a warning. Assistant Secretary of State Eliot Abrams went to Panama to get President Eric Del Valle to fire Noriega. Instead, Noriega forced out Del Valle and named a new president. After taking over as president, Bush increased the pressure. In May 1989 Noriega decided not to run in the election but backed another candidate, Carlos Duque. The opposition Panameñista Party nominated Guillermo Endara, who was immediately provided with $10 million by the Bush administration. Even though the election was being watched by former President Jimmy Carter (1924–) and other foreign officials, as soon as Noriega realized that Duque was losing, he ordered the PDF to seize ballot boxes. When the opposition took to the streets in protest, Noriega's squads beat them. Endara and a vice presidential candidate, Guillermo Ford, lost the election. Noriega declared the election void (having no legal force or effect), installed another president, and, in October 1989, survived a takeover attempt supported by U.S. forces. To improve the nation's international image and to prevent Noriega from naming one of his people as administrator of the Panama Canal, Bush took stronger action. Using as an excuse the firing on U.S. soldiers passing the PDF headquarters and Noriega's statement that U.S. actions had created a state of war, the United States launched a full-scale attack (Operation Just Cause) with twenty-four thousand troops on December 20, 1989. Fighting continued for four days, with the United States losing hundreds of troops and the Panamanians losing thousands. Noriega escaped capture for a few days but was found hiding in the Papal Nunciature, a religious office. Under pressure from Vatican officials, Noriega surrendered to the Vatican Embassy in Panama City on January 3, 1990. In a deal worked out with the U.S.-created government headed by Guillermo Endara, U.S. authorities brought Noriega to Miami for trial, which was delayed into the early 1990s. He was convicted of several crimes including cocaine smuggling. He was sentenced to forty years in a Miami prison and ordered to pay $44 million to the Panamanian government. In 1999 a French court sentenced Noriega and his wife to ten years in jail along with a $33 million fine. Also in 1999 the Panamanian high court announced that it would seek to have Noriega returned to that country to make sure he served time there for murder. In 2002 a parole hearing took place in Miami, which resulted in Noriega's denial for early release from his U.S. prison sentence. He would remain in prison in the United States for at least five more years. Dinges, John. Our Man in Panama: How General Noriega Used the United States and Made Millions in Drugs and Arms. New York: Random House, 1990. Harris, David. Shooting the Moon: The True Story of an American Manhunt Unlike Any Other, Ever. Boston: Little, Brown, 2001. Kempe, Frederick. Divorcing the Dictator: America's Bungled Affair with Noriega. New York: G. P. Putnam's Sons, 1990. Noriega, Manuel, and Peter Eisner. America's Prisoner: The Memoirs of Manuel Noriega. New York: Random House, 1997.